The fastest hunk of junk in the galaxy is ready for her close-up! We’ve already seen the new Millennium Falcon in action in the first Star Wars: Episode 7 trailer, as well as in a funny mash-up video with The Dark Knight. But Han Solo’s sweet ride takes center stage in some brand new behind-the-scenes photos within the latest issue of Fortune magazine. It’s funny to think that every little detail, rumor, leaked set photo or concept art from Star Wars: The Force Awakens has sent the Internet-speaking world into an all-out frenzy of geektastic proportions. Even the release of just a few of new character names had us practically foaming at the mouth, but there’s nothing like seeing the Millennium Falcon return in all her glory in this new official look. 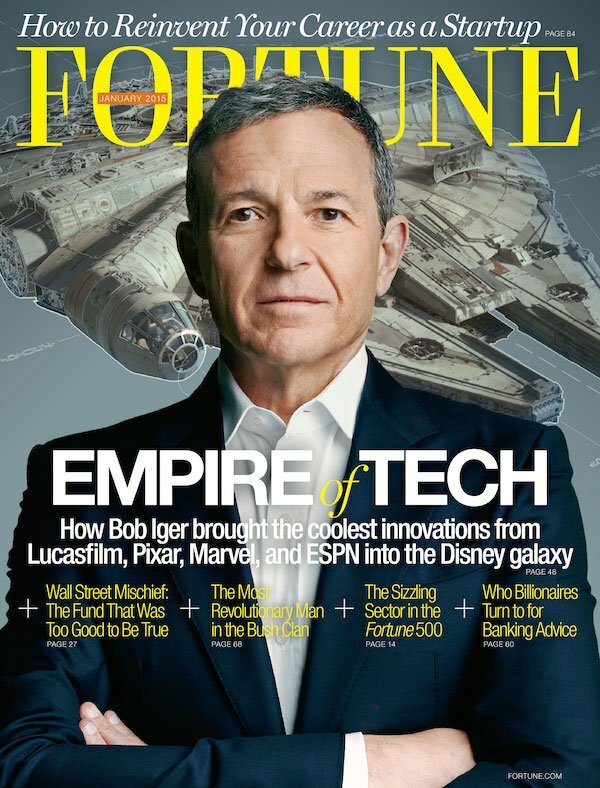 While Fortune admittedly tends to focus more on the business leaders dominating the world, the publication partnered with Lucasfilm’s special effects team Industrial Light & Magic to capture photos of Disney CEO Bob Iger and the Millennium Falcon. Funny enough, Iger isn’t actually standing in front of the Star Wars mainstay; his photo was shot in New York City and then superimposed in the foreground. Aside from the Millennium Falcon, Star Wars: The Force Awakens will feature a bevy of new characters, such as John Boyega as Finn, Daisey Ridley as Rey, Oscar Isaac as X-Wing pilot Poe Dameron, and a new droid that goes by the name of BB-8. Details on these characters are still unknown, but it’s safe to say they’ll encounter the likes of Harrison Ford’s Han Solo, Carrie Fisher’s Princess Leia, Mark Hamill’s bearded Luke Skywalker, Peter Mayhew’s Chewbacca, Anthony Daniels' C-3PO, Kenny Baker’s R2-D2 and a new Sith threat, Kylo Ren. Then there’s the other incredible cast members to consider, such as Oscar winner Lupita Nyong’o, Game of Thrones favorite Gwendoline Christie, Andy Serkis (who voiced the Star Wars: Episode 7 trailer), Max von Sydow and Domhnall Gleeson. Star Wars: Episode 7 (officially titled Star Wars: The Force Awakens) doesn’t hit theaters until December 18, 2015, but the first teaser trailer has already become one of the most-watched trailers of the year, and this new look at the Millennium Falcon only adds to the hype. You can bet we’ll be overanalyzing every new photo and trailer that comes our way until release time. After all, that’s part of the fun of the franchise.